So just to confirm 2a is still fine and 2 still has the problem. I'll have to figure out what else is different, I thought they were the same otherwise. EDIT: Or wait, you mean the ads are back being a problem in 2a? That's correct. I'm currently using 2a on my iPhone with no issues. When I revert to 2 the ads come back. Started seeing issues about 2-3 days back on Samsung Galaxy S9. Basically site is unusable now on mobile. Both Chrome and Samsung Internet apps behave same way as Diemenz's screenshot. Yeah it has been bad on mobile safari for about 4-5 days now. I don’t even bother browsing the site just go to email notifications on posts because navigation is a nightmare. Even closing the ad leaves the banner there and prevents any navigation on the top half of the forum. A content blocker will do away with it but then you lose Twitter links and a few others. I don’t like using them because that advertising is what keeps sites open but I don’t know if another option at this time. 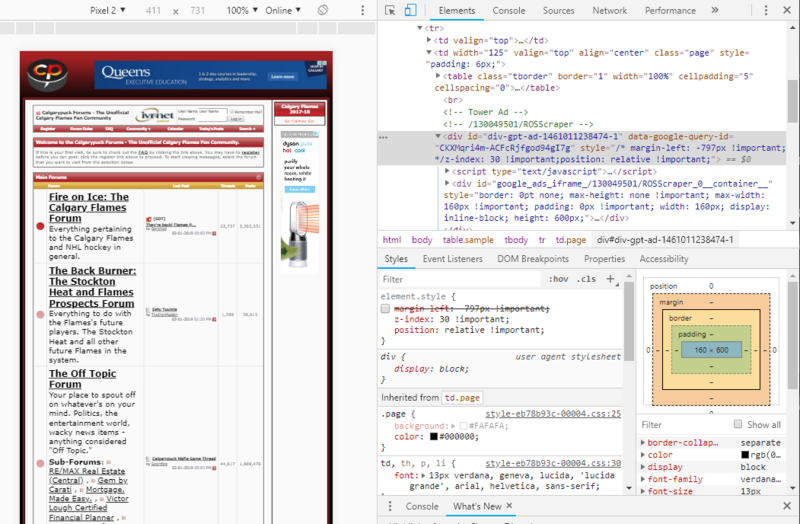 Not sure if this helps in the debugging, but the problem seems to stem from an incorrectly computed margin-left value for the ad's div tag. Here's the ad in the wrong location. 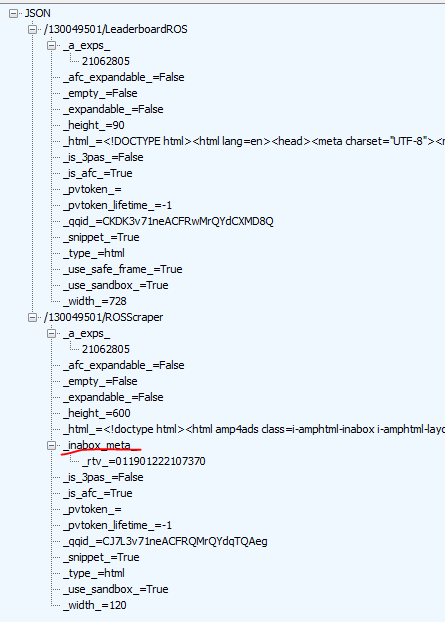 Note that the margin-left is set to -797px. I'm getting this as well now. Chrome and the Internet browser for Samsung. Took forever just to get into this thread! Last edited by flame^thrower; 02-01-2019 at 06:00 PM. It's weird that the two templates generate different results, still comparing to try and figure out what's different. Issue for me. Android, Chrome. Only way to click in is be super quick before ad loads, ad rest of page is unrepsonsive to clicks once ads load. If it pops onto a reply screen, SOL to type anything. Quarantine the problem to only appear the game threads and will save many of us mental anguish. Yeah I’m still good. Been on 2A for several days with no issues. Just doing a bit of debugging this morning. It looks like style 2a works because it is an older file that references the googleapis using http instead of https. This fails, and actually prevents the ads from loading. In style 2, the non-secure link to google's apis is commented out and replaced with some script which dynamically loads google's scripts via https. I suspect if the google scripts were loaded in the same way, style 2a would show the same issue. I'm taking a break, but will try to look again later today. Ok, had some time to do more debugging this afternoon. The script to generate the ads makes a call to the ad server to get the ad details. Unfortunately, this call sometimes returns "good" ads (ads that are positioned properly) and "bad" ads (ads that block the forum). Using Fiddler, I can execute the exact same request to the ad server, and I will get both "good" and "bad" ads. In the below examples, there are two ads returned. The first is for the top banner, the second is for the side. 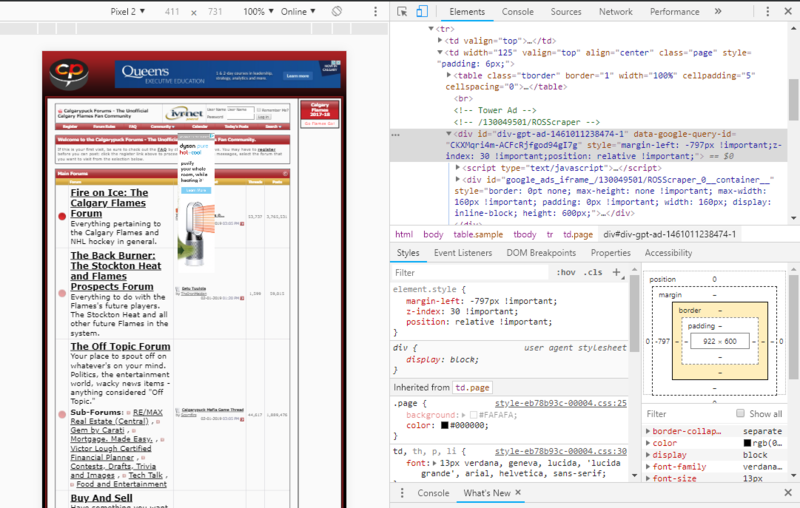 Notice the side banner ad has the _breakglass_mode_ = 2, which is what triggers the incorrect margin-left value. 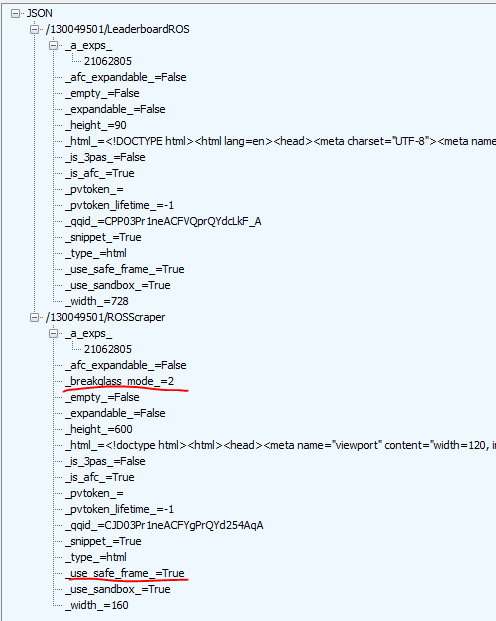 Also notice, it is tagged to "use_safe_frame", which is probably related. Since the call is exactly the same, there's nothing CP can do (such as change the call's parameters) to ensure it gets good ads. It is entirely up to the ad server. Because the margin-left style that gets set is inline, and tagged as important, there's no way to provide css to override it. I'll leave it to CP if they want to use the script or not. Use at your own risk. Also, if there is a new change to the ads, this script may not work. I think the script is harmless - at worst, it will poll every second and do nothing. However, it might be possible that this script violates the google ads TOS as they might not like post-manipulation of a served ad. This is a formatted version with comments. var pollTime = 1000; // 1000ms, or 1 second. // this function will run every second. // the id of the div tag that contains the ad. This doesn't seem to change. // get the ad's div tag. // if we were successful, the ad is up. Remove the margin-left style. This is a one line compressed version. Yeah I'd guess the script is probably a violation of the ToS though fixing their ads probably wouldn't get us in too much trouble. Instead I might just comment out the ad until we can get it fixed. No problem - happy to try to help a site I've enjoyed (for free!) for so long. Hopefully this is a genuine bug that Google can fix on their end. It'd be a shame for the site to lose ad revenue because of it. I updated Bingo letting him know what you found. This is happening to me too. I don’t know what everybody means by switching to 2a... can somebody run me through what that means?